Today we've released a major update to PCO Giving: an entirely new interface for your donors. It's fast. It's easy to use. It looks great on any device. There's no app to download and your donors don't even have to create an account or remember a password to use it. 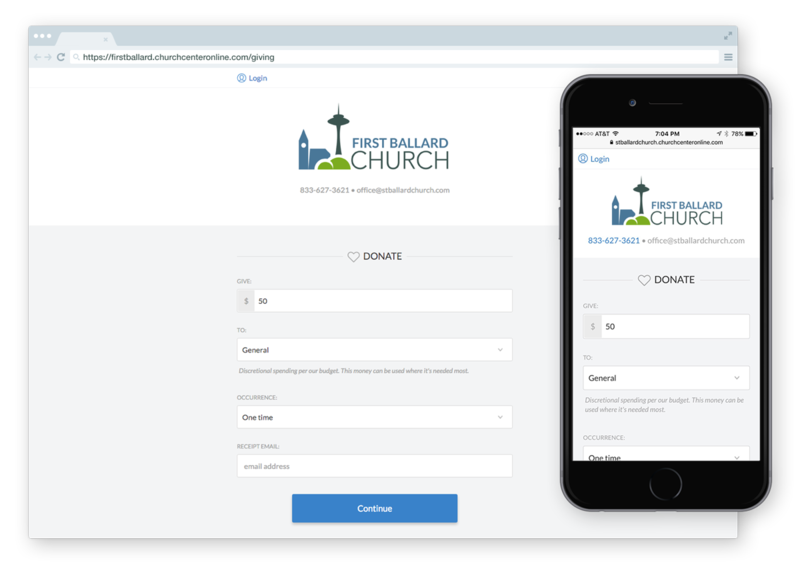 Your church name and logo are now front and center so it's clearer to donors that they're donating to your church. The color palette has been made to be a little more "web neutral" (white background, blue links, black text, you know… craigslist but with some class). Since most people use their phone to donate, we've made sure the interface feels great on iPhones, iPads, and Android phones. Donors can manage every aspect of their giving and they can do it with no setup, no user name, and no password to remember. All they need is an email address. Our goal was to try to make the process of giving as frictionless as possible whether they give regularly or spontaneously. See the epilogue below for more info about password-less login. In the coming months we'll also release a way for donors to log into their account using a short code sent by text message. Donors can now add their checking or savings account as a payment method. Once ownership has been verified, they can use this new payment method for occasional or regular giving. ACH transfers are a lot cheaper to process, especially for large donations. Now, donors can manage the recurring gifts they setup. Recurring gifts can also be put on hold indefinitely or until a specified date. 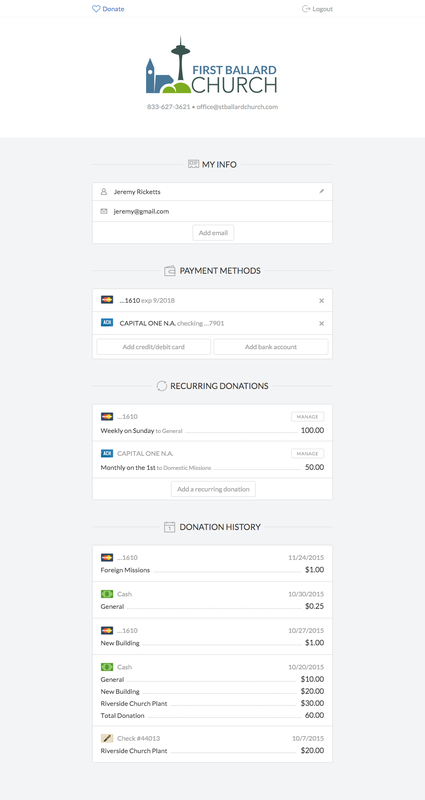 Donors can now save multiple payment methods they use to donate. These include debit cards, credit cards, and bank accounts. Credit and debit cards will have their expiration dates automatically updated once a new one is issued. If your church doesn't accept credit card donations, this payment method can be disabled on the admin side of PCO Giving. If someone gave cash last month, a check last week, and used their debit card this week they'll still see an unbroken history of donations when (and if) they decide to log into their donor account. We think donors will love seeing their complete donation history in one place. Administrators will love that they don't have to merge giving records- if your church uses Giving exclusively, it all happens automatically. Split donations. UPDATE: Split donations has arrived! Statements. The end of the year is approaching quickly. We know many of you will need to issue an end-of-year statement come January so we're working hard to get this feature delivered. Okay, that's it for now! Let us know what you think in the comments below! Epilogue: Password-less log in? Are you serious? We've already had a few questions about password-less login. Email authentication is something that's starting to be adopted by more services (like Medium and Square Cash). It has a few advantages over traditional passwords. The big advantage is better security. Passwords are neither secure nor simple. The vast majority of people re-use their passwords even though we all know we shouldn't. Practically speaking, most people don't have a strong, unique password for every site or app. The second advantage is that it completely removes the need for donors to go through an account creation process. If they donate and they have an email, their account is just created for them on the fly. We already ask donors for their email address (so we can issue them a receipt). The downside is that it's slightly slower. I say "slightly" because most of the time people donate online, they're doing it on their own computer or, most likely, their own phone. And on these devices, a donor is typically already logged into their email so the process is pretty quick. It definitely takes longer if you're using someone else's phone or a public computer but our data indicates that the vast majority of donors aren't. Medium wrote a great article about this type of account authentication that's worth reading if you have the time. PCO People for iOS gives your admins access to the information of all the people in your church, anywhere they are. With a couple of taps you can find somebody, give them a call, send them a message, or look up the info in their custom tabs. We've completely redesigned the profile page, making it much more powerful and easy to navigate. The Teams section gets the most new features, most notably combining both types of teams, which now allows members of all teams to set scheduling preferences.